What Happens When You Go To MEPS? Military Entrance Processing Stations are places where you will be put to the test. Nothing challenging really, but a long wait in hospital waiting rooms, taking the ASVAB, and getting sworn into the Delayed Entry Program (DEP) if all checks out with your medical evaluation and testing scores. Basically, the job of MEPS is to see if you are medically, physically, and academically qualified for the military. Your recruiter should prepare you for this experience. Most people who enlist on active duty make two trips to the Military Entrance Processing Station (MEPS). The first trip (described in our articles, MEPS at a Glance, and The MEPS Experience), is for initial qualification determination, and enlisting in the Delayed Enlistment Program (DEP). The second trip is for actually enlisting on active duty, and shipping off to basic training. Like the first trip, depending on how far away you live from your local MEPS, you may be required to report to a specified contract hotel on the afternoon/evening before. Meals and/or overnight lodging accommodations, if needed, will be arranged for you. Most applicants will share a room with another applicant and are expected to be considerate of other guests and hotel property. At some MEPS contract-hotels, you may be required to sign receipt of specific rules-of-conduct. If you're caught violating any of the rules, you may be returned home, without further enlistment processing. The main reason for the hotel is to have you ready to go first thing in the morning together as a group and not waiting for people who sleep in or stuck in traffic. Height / Weight Standards - Usually, the first thing that occurs is a height/weight check. Each of the military services have their own weight standards. If you exceed the weight standards, you'll undergo a body-fat-measurement. If you exceed the body-fat requirements of the specific serving that you're joining, your processing stops, and you'll be returned home. Whether or not you are extended in the DEP, to ship at a later date (after you lose the weight) is up to the service you are trying to join. If you are over the body-fat standards when you report to MEPS, you're not shipping out to basic training. In the Marine Corps, you will take the Initial Strength Test (IST) to determine if you are fit enough to become a Marine. Females will have to provide a urine sample to check for pregnancy. MEPS used to conduct a urinalysis drug test, but this is now accomplished by the individual services during the first or second day of basic training. Everyone will undergo a blood-alcohol test, however, to ensure that they are not intoxicated. After the weight check, you will generally complete a form which will ask if there have been any changes in your medical condition since your first trip to MEPS. Depending on your answers, you may or may not actually meet with a MEPS doctor. If you have a new medical condition which is disqualifying, you may be sent home. Therefore, it's important that you let your recruiter know about any changes in your medical condition as soon as possible so that he/she has time to process a medical waiver BEFORE you make the second trip to MEPS. Medical waivers take time to process, and it is unlikely that one will be approved if you disclose it on that final day. If you have any illness, aches, sprains, or pains from recent injury, it is likely you will be asked to come back later and not be cleared at this time. You have to be fully healthy. Following medical approval, you will meet with a counselor from the service that you are joining. The counselor will go over your active duty enlistment contract with you. It's important that you go over this contract carefully. Regardless of what is in the enlistment contract, this is the contract that will apply after you take the oath and go onto active duty. If your recruiter told you that you would be enlisting as an E-3, and this contract says you're enlisting as an E-1, then you're enlisting as an E-1. The same holds true for any special enlistment bonus, and special ops program (18x, SEAL Challenge, Option 40 Ranger contract, and Air Force Special Warfare). 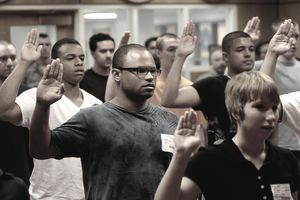 Active duty enlistment contracts can generally not be changed after you sign them and take the oath (Note: There are some exceptions to this, but generally, contracts are renegotiated only when in the best interest of the service). Another form you will be required to complete is the DD Form 93, Record of Emergency Data. The DD Form 93, when completed, is an official record of beneficiaries designated to receive the 6-month death gratuity pay and allowances, in the event of death on active duty (The Serviceman's Group Life Insurance is a different program, which will be accomplished in basic training) The DD Form 93 also contains the name and address of the person(s) to be notified in the event of sickness, emergency, or death. Right before taking the active duty oath, you will meet with a MEPS Interviewer and complete MEPCOM Form 601-23-5-R-E. The interviewer will go over the form with you. The primary purpose of this session is to give you one final chance to "come clean" on any false information that may be included on your enlistment documents, or to provide information about any additional medical, drug, or criminal problems that occurred while you were in the DEP. Typically, these questions are about hidden past drug use or other medical issues that were not fully explained to the recruiter or MEPS. After completing the form, and going over each answer with the MEPS interviewer, you will be briefed on the contents of Article 83, Article 85, and Article 86 of the Uniform Code of Military Justice (UCMJ). Article 83 covers fraudulent enlistments. Articles 85 and 86 are concerned with Desertion and Absent without Leave (AWOL). All three articles are applicable once you take the active duty oath. Members of the Armed Forces may be involuntarily separated before their enlistment or term of service ends for various reasons established by law and military regulations. You establish a pattern of disciplinary infractions, discreditable involvement with civil or military authorities or you cause dissent, or disrupt or degrade the mission of your unit. This may also include conduct of any nature that would bring discredit on the Armed Forces in the view of the civilian community. Because of parental responsibilities, you are unable to perform your duties satisfactorily or you are unavailable for worldwide assignment or deployment. You fail to meet the weight control standards. Following the pre-accession interview, and the separations policy briefing, you'll receive a pre-oath briefing (how to stand at attention, bending your elbow at a 90-degree angle, etc). You're then ready to take the active duty oath. Once you take the oath, you are on active duty. You are an active duty member of the United States Military. Family and friends are certainly welcome to attend the oath ceremony. Following the oath, you will be given a sealed envelope that contains your necessary papers (medical records, enlistment contract, activation orders, travel orders, etc). You will turn this envelope into NCO staffing the Military Reception Counter at your destination airport. Usually, you will be traveling with a group of others who are also shipping out to basic training. If so, the service will generally put one individual in charge as the "group commander," to ensure that everyone arrives at the final destination. At the designated time, MEPS will transport you (and the others) to the airport, and put you on a flight to your basic training location.